Jeremy Royal Howard | Apologetics. Science. Culture. Few things illustrate permanence and impermanence better than poking around in an old barn. 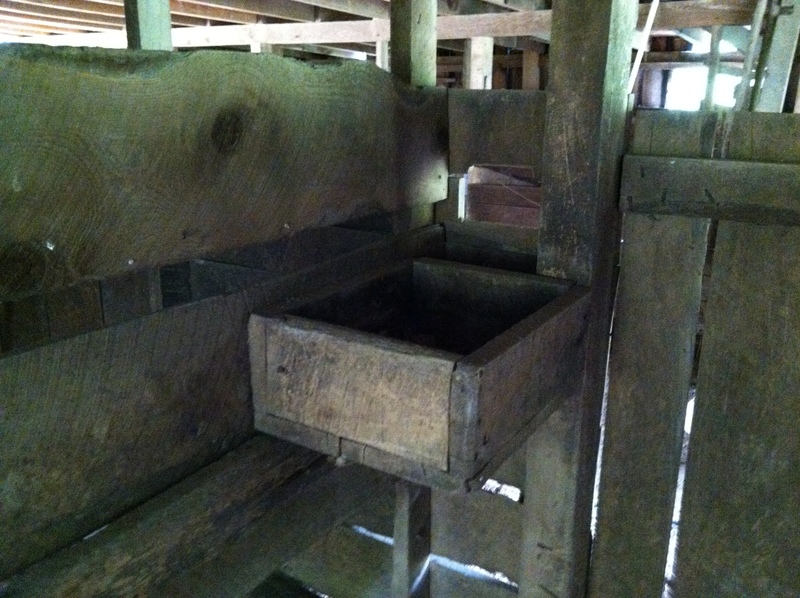 In the loft of the barn on my grandparents’ homestead is a woodworking shop. A tangle of vines reaches inside through paneless windows and wraps around beams and all the broken down odds and ends that litter the floor. 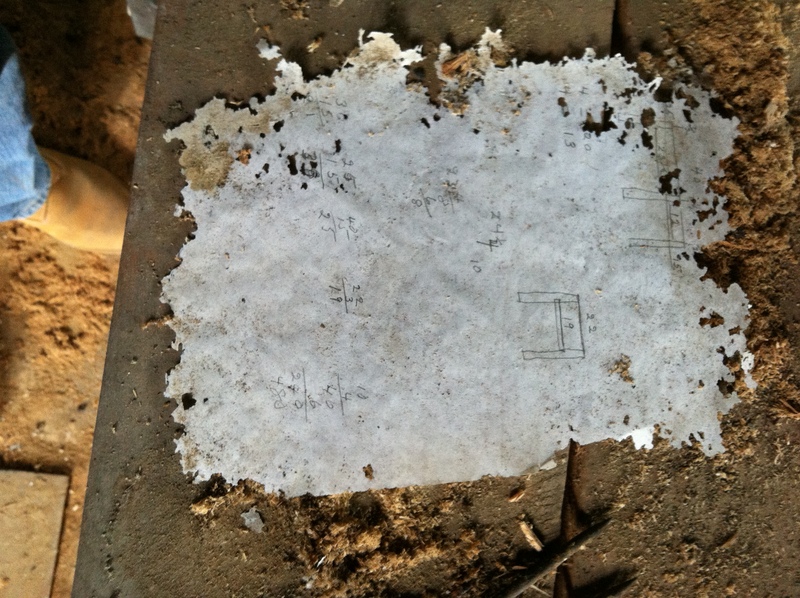 On one of the tables my son found a sketch, something my grandpa drafted years ago. How long ago did he form this plan? What was his purpose? Did he ever actually build this piece that he depicted on paper? Downstairs a feeding trough that was nosed daily by the horse my mother often tried to mount as a child stands as sturdy as ever. A grown man could stand in it and not budge it. The horse is long gone though, its name forgotten. It is the trough that remains, and it remembers. It bears teeth marks and harbors between its boards the grains that got away. On the floor over in the corner is a Pepsi bottle that’s older than my lifespan. Who drank it? Did they forget about it as soon as they cast it to the floor? The bottle has not forgotten. It sits there all these years later, unmoved and bearing still the fingerprints of the one who enjoyed it. So much is forgotten by us. If only these objects could voice their history, make even mundane facts seem fascinating. This is why I love the old places. They tell us with silent speech that we are here for only a short time, but that we leave behind things that others will pick through and perhaps ponder over. They tell us too that we’d better leave behind more than dust-draped hobbies and assorted curiosities. This my grandparents did. I see grandpa’s industriousness in this barn and its implements, a quality he must have instilled in my mother tenfold. In the old house up the hill I see books stacked everywhere, all of them read carefully by a grandmother who never had a shot at college or career. Her passion for reading was passed on to her children and to her grandchildren in turn. These are some of the best things my grandparents left behind, things that gather no dust and never fall silent. I want to tell you about my lifelong friends, Derek Haskins and Jerald Bryant. 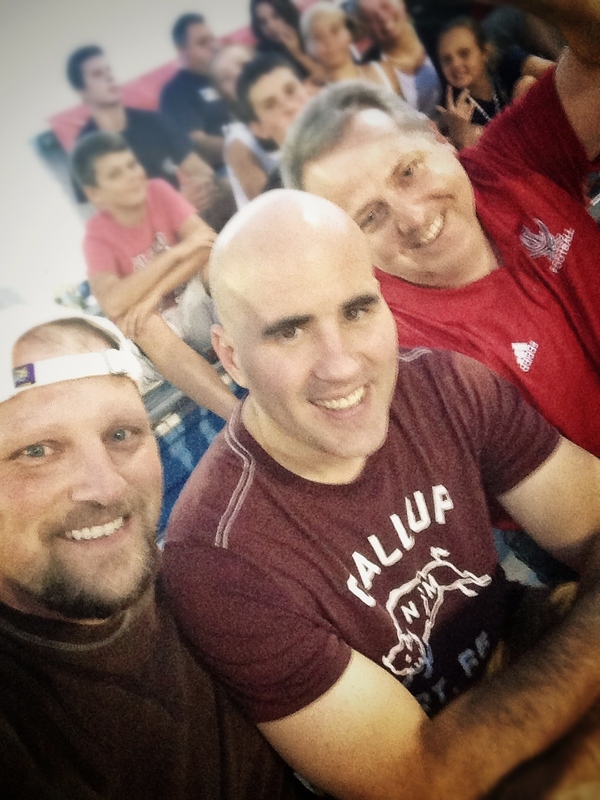 We’re all at the midlife mark now, and in the picture above we’re at a football game rooting for our alma mater, the Cookeville High Cavaliers, trying to figure out how so much life has passed by since our graduation in 1991. As I sat with them in the stands Friday night, I couldn’t help but notice that they haven’t changed one bit, and that the traits that made them my brothers thirty years ago have made them successful family men and professionals today. Derek and I played defensive end and tackle together on the gridiron until 1988. We were fierce on the field and full of bravado. Weight training was a matter of life and death for us, and we were pretty sure that great things awaited us on the gridiron. As it turned out, injuries ended our “careers” after our sophomore season, but that was okay because we teamed up as equipment managers and ruled a small kingdom from the Eddie “Jelly” Watson Fieldhouse. We devised all sorts of mischief while our classmates sweat and bled under the sweltering sun. We came to see our banishment from the field as a kind of ascendancy. One thing that stands out for me from this time is that Derek and I lived to make running commentary on all the absurdities (real or imagined) we encountered. We just couldn’t shut it off. And in situations where we knew we had to keep it under control, the one thing we knew not to do was make eye contact. But for all our sarcasm and jabbing at ourselves or others, we were good at heart. This was always especially clear to me in Derek. He cared for people. As a teen, he used to read psychology textbooks in his spare time because he wanted to understand people. It was weird and we all mocked him for it, but people were his science and his ministry. That same trait has helped make him an icon in country music radio today. For 20+ years people around the country have known him as Big D (of Big D & Bubba). Listeners laugh at his antics but also cry at his acts of caring. For me, he may as well be right back there in the old Fieldhouse, for nothing has changed. Family, friends, and faith have always been big for him, and as a result the fame he has won is merely incidental. Ask his wife and sons to describe him sometime, and what they tell you won’t have anything to do with radio. While Derek and I spun tales and invented inscrutable tape-ball games in the air-conditioning of Jelly Watson, our pal Jerald was out on the practice field becoming a force and a legend. Jerald was never the biggest or fastest, but he was dogged and played smart football. During our senior year he played every down on offense, defense, and special teams and won the inaugural Iron Man award under head coach Jake Libby. Today Jerald occupies a spot on the Hall of Fame wall at Cookeville High. Neither Derek nor I are on that wall, but maybe we played a small part of putting Jerald there by keeping him in good equipment and filming his exploits on game day. Give us that much at least, Jerald! And he will, because he has the truest heart I’ve ever known. He is open and honest and lives by a deep-rooted integrity. He really will give you the shirt off of his back. He probably even knows how to make it for you, because he is a craftsman and artisan. He values people and faith and good deeds and will remember everything about you and everything you’ve ever said to him in a conversation. Just give up arguing with him, because he remembers. And if you visit his dental office, be prepared for the fact that he will memorize everything about your teeth and hold it all in his mind forever. He will ask you about that bicuspid a decade later when he runs into you at Kroger, even if you’ve never been back to his office. And after discussing your bicuspid, he will tell you all about his wife and four kids, because he’s a family man above all things. The Cavaliers won the game 47-0 on Friday night, but the biggest win I witnessed was in the lives of my lifelong friends, my brothers by choice. It seems that you are putting forward a false dichotomy: brain activity vs. objective experience of heaven. As a nonmaterialist, I don’t see consciousness as ultimately reducible to brain activity (I think you give neuroscience way too much credit). Have I Put Forward a False Dichotomy? One puts forward a “false dichotomy” when one presents an “either/or” choice between two options when in fact there are other options that should be considered. This is also known as false dilemma, as for example when someone says you must choose between bacon and eggs when there is also ham on the menu. When Dembski says I put forward a false dichotomy, I take him to mean that I assume NDEs are either (1) purely brain-based experiences that in no way put one in touch with the afterlife, or (2) objective experiences of afterlife by the immaterial consciousness that have no corollary in brain activity. Apparently Dembski is open to a third way, a way in which we can describe NDE experiences as simultaneously having material and immaterial components, and this presumably matches his general approach for explaining consciousness. Of NDEs, perhaps Dembski would say that the mind really is off in heaven engaging the immaterial afterlife while at the same time the physical brain is struggling but still active, alive, and entangled with the experiences of the immaterial mind. Dembski will need to clarify if I am mistaken. All I can say is that such a view seems unsupported by the evidence but is perhaps necessitated by some varieties of dualism. I am not deciding against some kind of dualism being true (classical dualism has been in retreat for centuries, and modern models are modified regularly as neuroscience advances), but I find it significant that there is growing evidence for a biological basis for NDE/OBE phenomena. Add to this the obvious theological/biblical problems stemming from NDE/OBE testimonies, and I feel secure in suggesting that the Christian attitude toward these “afterlife” experiences should be a good deal more skeptical than it presently is. If NDE/OBEs are increasingly biologically explicable, and if the testimonies stemming from them are biblically problematic, should Christians not gladly call them fiction without thinking that in doing so they have decided the whole physicalism vs. dualism issue? One strong evidence for NDEs being brain-state events and not disembodied ventures of an immaterial mind that has escaped a dead brain is the fact that patients who come back from an NDE/OBE often report that they experienced pain during the NDE. One man having an NDE was sent falling back to earth when he was shoved by someone (an angel?) who had a burning-hot hand; not coincidentally, this patient was suffering from fever due to an abscess in his arm. In an even more vivid case of intrusion, Howard Storm was wracked by abdominal pain while being led to hell in his NDE. This was directly related to the fact that Storm had been hospitalized in critical condition for a perforated stomach. Apparently pro-NDE advocates would have us believe that Storm was dead enough to have a genuine and disembodied experience of the immaterial afterlife, and yet alive enough to be troubled back on earth by raging nerves sending pain signals up his spinal column to his brain. Does that make any sense at all? If you are dead and off to the immaterial realm to experience God and loved ones, can you also indwell a damaged body that is reporting its troubles to you? Importantly, pain intrusion is something that regularly happens to us in our dreams. Your sprained thumb is aching and in your dream you’ve caught it in a door. If that sort of thing is a brain-based intrusion, on what basis would we say that pain intrusion during an NDE is not also brain-based? I argued previously, in step with mounting evidence, that genuine brain death is not a part of NDE. The brain is still alive during an NDE, which is why the patients eventually come back around and do not have brain damage. If they experience pain intrusion during their purported visit to the afterlife, it is because their brain has most likely driven the whole experience. Dembski is correct to say that my alternative explanation for the boy’s knowledge of his sister is speculative. All I would add is that (1) it is plausible speculation (see my original post), and (2) my speculation might be judged quite attractive to Christians when judged in light of the totality of evidence and the weight of discordance between the boy’s overall testimony and the biblical witness. The NDEs that have persuaded me most are those where patients access information about their setting (usually a hospital) to which they would have had no direct access. Now one can always argue that these are not controlled experiments, and so there might have been some access after all. This is how James Randi and other skeptics deal with all psi phenomena. And I see you taking the same tack. The type of skepticism that you seem to be buying into is dealt with, in my view, effectively in Dean Radin’s THE CONSCIOUS UNIVERSE. Dembski is persuaded by NDEs in which “patients access information about their setting . . . to which they would have had no direct access.” I would be persuaded by such NDEs as well, if we had any record of them. But we don’t. What we do have are stories, most of which are told to retrospective investigators months or years later and cannot be corroborated in any way. In the most famous case of all—hailed by pro-NDE advocates as unassailable evidence—aneurism patient Pam Reynolds offered a description of the bone saw that was used to open her skull. It was not possible for Pam to view the instrument with her eyes, for they were purposefully obstructed, plus she was under general anesthesia and had been cooled to a metabolism-halting 58 degrees. Had Pam described the bone saw accurately, it would suggest that she had obtained information by some means other than her five senses. However, it turns out that Pam got all but the most basic details about the saw wrong. Why seize upon the minority of details that Pam got correct and take these as evidence that she literally stared down at the bone saw from the ceiling and set aside the majority of details which she got incorrect? I can think of only one reason: you are motivated to accept flimsy evidence for a conclusion you already hold. Further, a great many people can describe a bone saw at least as accurately as Pam Reynolds did even if they have never entered a surgeon’s theater, for movies and television occasionally portray such instruments. Pam likely heard the whirling burr of the saw via bone conduction as it set her skull to vibrating, and in a fleeting moment of consciousness (a surprisingly common feature of patients under general anesthesia) drew upon previously viewed images of bone saws, hospital rooms, surgeons, and her own body to form an image of the scene. We all face a challenge when sorting out the merits of testimony and anecdotal evidence. Simply put, all too often we are biased, sloppy, and lazy. We prejudge a matter, deciding for or against a witness based on sketchy factors. We accept testimony and anecdotes uncritically when they fit with our expectations and our worldview, and reject them just as uncritically when we perceive that they clash against beliefs we cherish. And how often are we genuinely thorough in vetting the claims presented to us? How often do we search the foundations upon which our opinions are based? I suggest that many who read pro-NDE accounts seize upon the testimonies and conclusions of NDE experiencers since it affirms their afterlife views, and never bother to read or take seriously the critical accounts. They recite the “evidence” to others, everyone feels uplifted, inspirational movies are made, and the nagging details undermining NDE credibility go unmentioned. Speaking of sorting out testimonies, I’m reminded of a circumstance that played out in my home this morning. One of my sons came down from his shared bedroom reporting that his older brother had awakened him at 11:28 PM by sending and receiving text messages. The details were abundant, precise, and plausible. In the larger context, the offending brother has really been glued to his iPod lately. Nothing about the younger son’s report suggested I should suspend belief. Thus when the accused came downstairs, I started to give a lesson on iPod protocol, but I was cut short when he pointed out that his iPod had been sitting in my office charging all night long. So it turns out that little brother had a vivid dream which he mistook for reality. He was misled by a dream, and I was misled by accepting his plausible report. I share this story to illustrate that many plausible, heartfelt testimonies are literally untrue, and it sometimes takes tenacity to arrive at the truth. Furthermore, and as a further aside, if vivid dreams can be mistaken for reality, is it any stretch to suggest that the strivings of a death-endangered brain can have the same impact, especially when modern medicine has shown that a brain in crisis will do things electrically and chemically that promote heightened states of consciousness and feelings of euphoria? A number of researchers have conducted prospective studies in which attention-grabbing “targets” or coded cards were placed high atop medical equipment or cabinets in operating rooms, setting up a situation where the targets would not be visible to anyone unless they were looking down from the ceiling, which purportedly is the vantage point enjoyed by OBE patients. In the best-designed experiments the patients and medical staff were not told about the targets so as to avoid information leaks and confirmation bias. Though a handful of patients in these rooms reported having NDE/OBE episodes during the time in which the targets were present, not one of them has reported seeing the hidden cues. How can they have missed seeing objects that were designed to catch their attention if OBEs are supposed to be times of heightened, almost supernatural awareness above the body? Did they float up into the wrong corner of the ceiling? Or is it that the sights and sounds one perceives during an OBE are artificial constructions of a brain in crisis rather than direct perceptions made by a detached self (mind or soul)? The nature of these prospective studies is such that OBEs could be proven veridical at any time if patients would just come back from the dead and report on the targets, so any negative conclusions we draw here must be tentative. Even so, the silence has stretched across numerous studies by now, and it does not fit with the pro-NDE model. What Dembski has construed as a skeptical bias is in fact nothing more than due caution, a disciplined approach any investigator should take when attempting to sift fact from fiction. Dembski, it seems, would have us run to embrace OBE and NDE claims in a credulous manner. That I will not do, and I deny that I ought to be ranked with James Randi simply because I stand with sober minds everywhere when I insist on turning over every stone instead of hastening to embrace fantastic claims that ostensibly support my worldview. Dembski likens my critique of NDE/OBE claims to that of James Randi and “other skeptics,” and refers to “the type of skepticism that you seem to be buying into.” Randi is a famous magician whose investigative methods have exposed as fraudulent a great many paranormal claims over the past fifty years. Randi also happens to be a strident atheist, and so it seems that Dembski means to say that I’m working out of the wrong playbook in my critique of NDE/OBE literature. Well, if taking a sober and inherently cautious approach to paranormal and otherwise extraordinary claims is a play only skeptics can run, then I admit to being a brand of skeptic. Not in the philosophical sense of denying the possibility of knowledge or the metaphysical sense of presuming the non-existence of the supernatural, but in the everyday, scientific sense of expecting that phenomenal claims most often have a natural explanation after all. Dean Radin a reliable source? Dembski points to parapsychologist Dean Radin’s book, The Conscious Universe, as a recommended source for refuting standard approaches to consciousness and NDE/OBE. I do not believe Radin should be construed as an able guide on any subject. Radin roams around outside the borders of mainstream science and religion due to his advocacy of a whole raft of fringe theories, and is perhaps best described as a naturalistic anti-materialism. He rejects the materialist worldview—for which Christians may rejoice—but hypothesizes that miracles are not the work of deity but instead reflect the work of unknown natural laws. Radin believes in paranormal activities not because he thinks spirits or divinity indwell the universe, but because the world is just a trippin’ weird place where remote viewing and clairvoyance are true aspects of reality. Just as many within young-earth creationism and intelligent design are prone to do, Radin rests too much of his case on the claim that the majority of scientists have become captive to paradigms that wall them off from truth. He speaks about theory-driven bias and outright conspiracy so often that you would think the whole scientific enterprise is futile group think. He tells us that meta-analysis of dozens of failed experiments proves that they were successful experiments after all, a real case of 0 x 0 = 1. He claims that evidence for psi is regularly suppressed, and that psi researchers are ridiculed and marginalized for their nonconformity. Do psi researchers have trouble getting funding for their programs? Yes, and Radin is quick to tell us it’s because psi is being frozen out. Never mind that funding is the constant, universal challenge for all researchers, whether their views are scientifically orthodox or heretical. And never mind that there is a vast literature demonstrating that psi experiments have failed to demonstrate the reality of psi, thus discouraging further research. Do you believe in reincarnation? Dean Radin does, and he points to children as the source of our best evidence since their past lives are only recently past and are thus more readily available for recall. Radin argues for the reality of field consciousness, whereby a large group of people thinking the same thoughts at the same time are able to exert influence on the physical world, and remote viewing, whereby a “viewer” holed away in a dark, lead-shielded room can in his or her mind “see” what is located on the other side of the world when given map coordinates even though they have never traveled there or been shown photos. Regarding remote viewing, Radin would have us believe that the CIA proved all of this to be true decades ago, but then shut down the program in the 1990s. The CIA proved that it is possible to spy on our enemies without satellite, electronic eavesdropping, or secret agents, and yet walked away from it? The truth is, Radin is picking through the CIA scrap pile thinking he’s finding the real goods, and Dembski undermines his own case by pointing us in his direction. As for the insights people with NDEs have about heaven, one can hold them up to theological yardsticks and find them wanting. But I’m not sure that invalidates them. I’ll grant you that none of these experiences that I’ve seen recorded or written about have provided information that would unequivocally implicate the supreme being of the universe . . . But let’s not forget that the Bible itself doesn’t provide such slamdunk information of an afterlife. Jesus had more than an NDE—he actually was dead and came back. When he came back from the dead, why was he unrecognizable? As people saw him after his resurrection, did he always look the same? Did his apparent age stay fixed? The Bible doesn’t say. But it does seem to indicate that every time people saw him, they had to do more than a double-take to make sure it was him—they actually had to interact with him. I would warn readers about reading too much into Dembski’s statement that NDE claims may not be invalid even if they do not measure up to the theological yardstick. I know Dembski to be a man who has a great grasp of historical theology, and by and large I would say he is planted firmly in the Reformed tradition. Even so, I have trouble making sense of what he has said above. NDE testimonies are wildly odd, inconsistent with direct biblical testimony, and have the quality of shifting and swerving from one scene to the next just like dreams. My repeated question in light of these facts is: why should anyone take NDEs seriously? Folks of every worldview tend to describe NDEs as the most real, life-changing event of their lives, and even in Christian nations the theology is most always unbiblical. Universal salvation is a common theme. Forgiveness is freely given with no reference to Christ’s atonement. There is a strong moralistic strain as NDE experiencers are made to review their entire lives so they will understand the impact of every choice and word they’ve authored. Retrospective studies show that they come back from their NDE with a generalized, non-creedal religious outlook that shuns organized religion and instead focuses on spreading a message which says essentially, “Don’t worry; be happy” and “It will all work out in the end.” All of this leads me to conclude that if the theology of NDEs is true, then the theology of the Bible certainly is not. I said in my original post that I am of course unable to offer a definitive verdict on NDE/OBE reports. I feel that way now as much as ever, but uppermost in my mind are the distressing, nagging credibility problems that attend the whole topic. No one should overlook these, no matter their worldview. For more than five years I had a professionally developed, static site at jeremyroyalhoward.com. The day it went live it featured a few Ph.D. papers I had written as well as some book projects I had been involved in to that point in my career. It featured exactly those same things five years later. The site was not easy to update, and so I left it sitting there, a non-interactive time capsule that did little more than fetch me some email contacts from occasional wanderers who stumbled onto the site. WordPress holds out promise of providing something more useful. Assuming I can learn a few new tricks, I plan to post here any observations or speculations that can further discussion of things that I believe matter. And I reserve the right to be completely frivolous on occasion.